A report today claimed a ‘secret deal’ had been made which would see Irish Water forced to automatically fill vacancies after retirements. IRISH WATER HAS come out water guns blazing today after a front page story in the Sunday Business Post revealed a “secret deal” to automatically fill vacancies among council staff working for Irish Water. The newspaper report said minutes from a secret meeting show union leaders forced the government into this deal to fill vacancies once workers retire. It also said this would make it difficult for the new semi-State body to achieve its cost-cutting targets. A spokesperson for Irish Water issued a statement this afternoon vehemently denying suggestions that staffing in local authorities would not be reduced. He said today’s story “flies in the face of known facts”. “Irish Water will enter 2015 with 10% fewer staff in local authorities than were deemed to be required to maintain Ireland’s water services just one year ago – demonstrating that the agreements made with Local Authorities are delivering the changes required,” he explained. Between now and the end of 2016 Irish Water will reduce its operating costs by 14%. 7% of this reduction will take place in 2015, with a further 7% in 2016. By 2021 Irish Water will have reduced expenditure by approximately €1.1 billion. This will involve reductions in all business costs including staff numbers. The spokesperson also brushed off implications that there had been anything secret about this issue as it forms part of the service level agreements with local authorities – a framework that has been in the public domain for 18 months. “Our cost reduction plans, which we believe are unprecedented in scale for a public utility in Ireland, are being devised and implemented in consultation and agreement with 31 local authorities and unions representing their staff, with whom we have a very good working relationship.,” he added. Email “Irish Water insists it WILL be reducing local authority staff numbers ”. 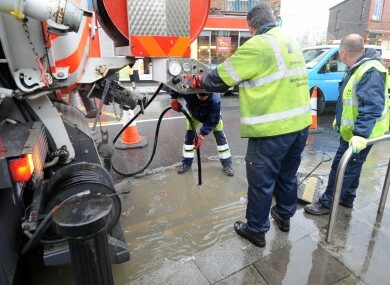 Feedback on “Irish Water insists it WILL be reducing local authority staff numbers ”.